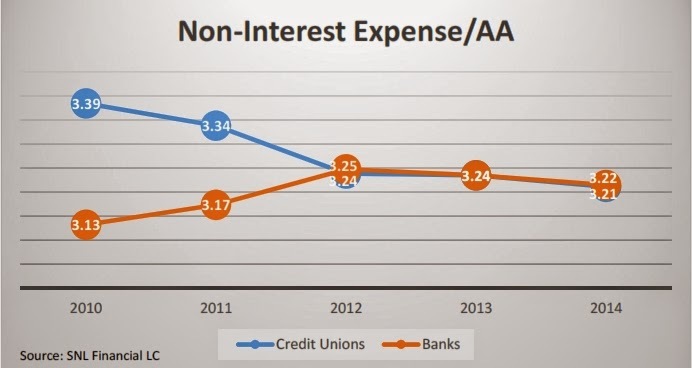 Jeff For Banks: Perception Versus Reality: Do People Get More From Credit Unions Than Banks? Perception Versus Reality: Do People Get More From Credit Unions Than Banks? The Credit Union National Association (CUNA), the credit union equivalent to the American Bankers' Association (ABA), states that credit unions exist to serve members, returning earnings to members in the form of lower loan rates, higher interest on deposits, and lower fees. Nearly four years ago, I tested the higher interest on deposits claim in a guest post with the exact title on The Financial Brand, an industry publication geared towards marketing executives at banks and credit unions. The reaction that I received, in person, via e-mail, and in the comments were a little sharp-edged. Clearly this remains an emotional issue. When the going gets tough, go to the facts. 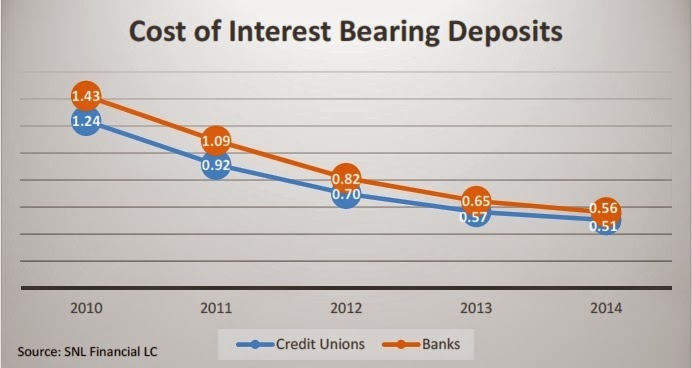 In 2011, banks paid higher interest on their interest bearing deposits than credit unions throughout the measurement period. When I re-ran the analysis, what was true back in 2011 still holds true (see chart). There is a difference in my analytics. I searched on banks and credit unions between $500 million and $5 billion in total assets. I took a wider swath in 2011 with institutions between $100 million and $10 billion. Today's analysis reduced the amount of very small financial institutions. I continued to control for commercially oriented banks by limiting to banks with less than 30% commercial real estate or commercial business loans as a percent of total loans. Those banks tend to have higher level of business deposits, which tend to drive down cost of deposits. However, to further control for this, I only selected interest expense as a percent of interest bearing deposits, not counting checking accounts that pay no interest. Based on the above, for the sum total of all interest bearing deposits, banks pay higher rates, on average. Surprisingly, changing the institution size did tell a different story in non-interest expense to average assets, or what is termed the expense ratio (see chart). Perhaps the financial crisis, which credit unions survived surprisingly well with the exception of corporate credit unions (similar to bankers' banks), woke up credit union leadership to scrutinize operating expense to increase profits. Yes, you read profits. Where do you think credit unions get their capital? If credit unions suffered a similar fate to many community banks, they couldn't back up the truck for shareholders to pony up equity to help absorb losses. Becoming more profitable was the logical solution to building up capital positions. There are probably other reasons at work. In 2011, those expense ratios for credit unions were in the fours (greater than 4%). That was likely due to my going down to institutions with $100 million in assets. While I did the same for banks, many smaller banks are privately owned, one branch operations with very low expense ratios. By raising the bar to $500 million, my analysis likely raised bank expense ratios by excluding those hyper-efficient small banks, and reduced credit union expense ratios by eliminating very small, inefficient institutions. As the charts show, there is little difference in expense ratios, on average, for the measured institutions. I think both trend charts show something that previously happened between thrifts, savings banks, and commercial banks: the homogenization of business models. 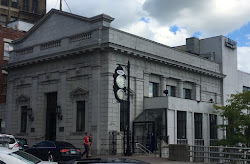 In the late 1990's, many traditional thrifts entered commercial banking with both feet. The result is falling net interest margins for banks and rising net interest margins for thrifts, long term. Thrift expense ratios began to rise as they took on the more expensive commercial banking teams. Credit unions are shedding their Select Employer Group (SEG) strategies by adopting community charters or by adding so many SEGs that nearly everyone qualifies to join. They have entered commercial banking to the extent permissible by their regulators. So I expect financial performance ratios to begin looking more and more like their bank competitors. Except for the shareholders. And the taxes. Do you thing credit union and bank business models getting more similar?